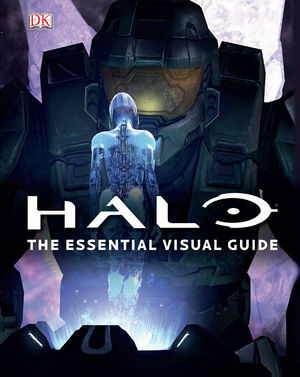 Halo: The Essential Visual Guide is a visual guidebook of the Halo universe, published by DK Publishing on July 4, 2011. The book contains images and additional information on the locations, characters, creatures, vehicles, and weapons from the Halo universe. Each page in the guide is dedicated to one element, focusing on its role and significance in the Halo universe. The book also features over 600 pieces of screenshots, renders and several pieces of artwork specially commissioned by Microsoft artists. The book was a collaboration of many at 343 Industries and was primarily written and overseen by Content Creator Jeremy Patenaude. In addition, 343 Industries consulted Stephen Loftus, a long-time Halo fan known for his technical analyses on various aspects of the Halo universe, as a technical advisor on some of the details, as a general fact checker, and to create additional info where needed. A separate book, Halo 4: The Essential Visual Guide, was later released to cover new material introduced in Halo 4. “ The essential visual guide to the Halo universe. Take a journey into the world of Halo and discover everything you ever wanted to know about the characters, creatures, locations, vehicles and weapons from Halo, Halo 2, Halo 3, Halo Wars and Halo 3 ODST. Each page in this handy guide is dedicated to one element, focusing on its role and significance in the Halo universe from Master Chief, the Arbiter, the Halo Array, the UNSC Pillar of Autumn, and the Spartan Laser. It also features over 600 specially commissioned artworks by Microsoft artists. A must have for any Halo fan. Halo: The Essential Visual Guide is an A to Z reference for characters, vehicles, locations, and weapons of the Halo universe. Each article contains an introduction, a large picture and statistics of the subject, as well as facts and trivia. Every game in the series as of the book's release—up to and including Halo: Reach—is well documented throughout. The entries in the guide are color-coded by affiliation (UNSC, Covenant, Forerunners, Flood) and arranged in alphabetical order according to their most common names. On page 4, in Statistics the word Air "Assault" is misspelled Air "Assult". On page 12, the main illustration used to depict Arcadia is actually the planet Harvest from the first cutscene of Halo Wars. On page 16, it is erroneously stated that the MA5C assault rifle does not appear in Halo 3: ODST. On page 33, the MA37 assault rifle is mistakenly referred to as the MA5C assault rifle. On page 38, the Type-51 Carbine is in one instance mistakenly referred to as "Type-52". On page 61, the Sangheili rank of Imperial Admiral is mistakenly listed as "Imperial Commander." On page 74, UNSC Forward Unto Dawn is mistakenly said to appear in Halo 3: ODST. This is likely a misattribution of the UNSC In Amber Clad's cameo in that game. On page 81, the abbreviation of Flood Super Cell is misspelled "FCS" instead of "FSC". On page 93, High Charity's population is listed as 23,831,346. According to the Bestiarum, this is instead the total number of San'Shyuum in the Covenant. On page 119, the MA37 assault rifle's shroud and barrel are misaligned, giving the appearance of two under-barrel flashlights. On page 126, the M274 Mongoose is in one instance mistakenly referred to as "M247". On page 160, the Rookie should be listed with "UNSC Marine Corps" instead of "UNSC Navy", similar to his squadmates' entries. The front cover and spine feature a silver metallic logo.